Yarn: Rheuma Thermal Wolle by Schachenmayr, a 100% merino yarn that is very good for lace projects. Stitch count: 20 (+5), one repeat has 24 rows. Comments: An easy and intuitive pattern. I rather like the large and small diamonds that are formed on this lace. Very pretty! 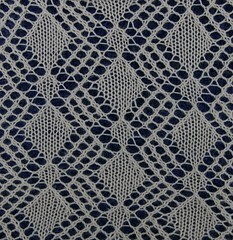 the zigzag lace is an interesting pattern,would like to see it used on a garment though to get the full effect.